I decided to pull the silicon fish blinky app off the market. At the bottom are the comments I was getting. I can't handle the shame. I wasn't able to test the app on other platforms because I didn't have any extra phones. I've since got a motorola droid 4 and the LG doubleplay that I found and repaired. If I get some spare time I'll get the app working on those and republish it. Fun while it lasted. Lesson learned, don't do a flashlight app unless you have access to a lot of phones because the LEDs work differently on different devices. I gave it away free and still got trashed. I put a disclaimer. Oh well. At the end I had over 2900 installs, but as near as I can tell only 300 active users after 6 months on the market. And in case you were wondering, never made $0.01 on it. The only way to make money is to put ads or charge for the app, neither was I willing to do. It was a project for fun, not for public abuse. Does not work for Droid Charge Does not activate LED on the Droid Charge, thus making this a useless app for that device. Gay Doesn't turn on. There is no zero star option by the way. Acer A500 N'a pas fonctionné. GREAT Idea and no stinking ads NO ads or tracking but it just dosent work for my phone. Thanks, wish all app developers had your attitude. A+ Can you change the background to plain black? to save battery. Because of my sense of humor, I'll share my fix for a bad fan on my XFX Radeon 4890 graphics card, otherwise known as a VGA cooling fan. Why did I do something this lame?... here is the story. The fan began making noise, which my son ignored for many months. Eventually the machine started randomly rebooting. Finally it started rebooting after about every 1 minute of operation and I had to give in and figure out what was wrong. The card was smokin' hot and the fan was not turning. Obvious. 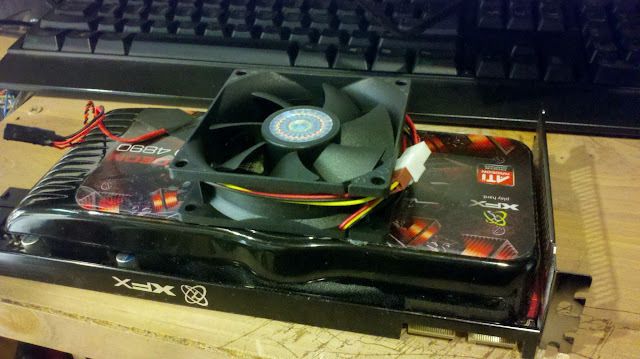 Here is what the card looks like with the factory fan. Doh. Total fail. 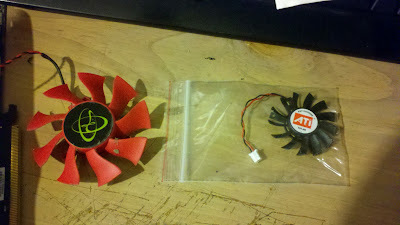 It came in a tiny envelope and here it is next to the fan from the 4890. WAYYYY to small. I had no confidence that any of the other fans out there were the right size either. I could play dialing for donuts and keep buying fans until one fit. Nahhhhh. 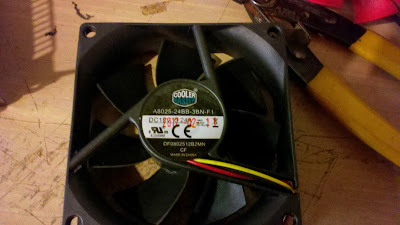 Measuring the fan against a standard case fan, I saw that they were the same size. 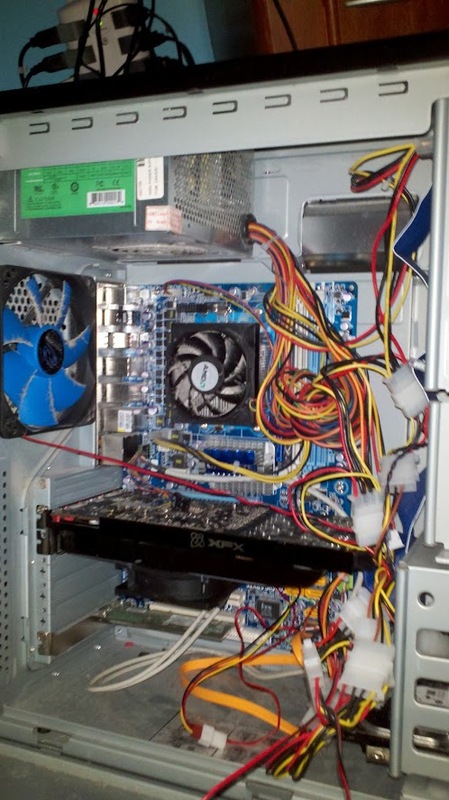 Originally I thought I'd hack something together and ordered this case fan. You may be able to see that the fan has three plastic spokes that attach it to the case, that could easily be clipped to remove the fan, which appears to be exactly the same size as the fan I'm replacing. However i'd be stuck trying to figure out how to attach it to the metal heat sink with no screw holes. Glue wouldn't work here, it would be too hot. 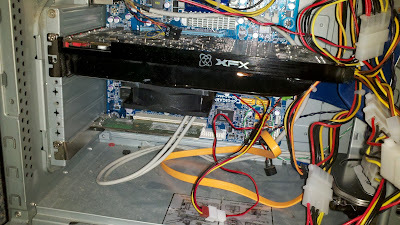 Since the computer case is fairly empty, and the PCI slot next door is open, I had room to simply glue the case fan over the hole to the VGA card. 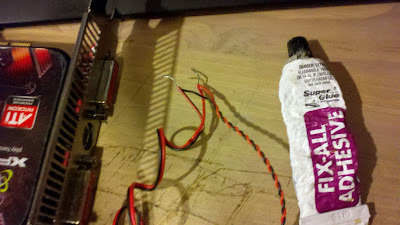 I spliced the red and black wires into the old fan's connector since the case fan's connector wasn't the same size. As soon as the glue dries it's going into the machine. I'll update the post with how it works out. Crossing my fingers. 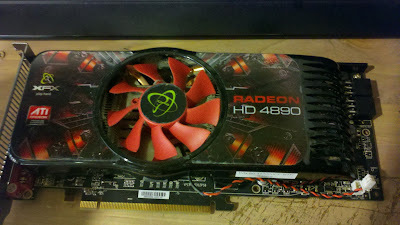 Turned out if you look, the video card had a plastic film still on it from the factory, that I never had peeled off. So my glued-on fan fell off immediately. If you look you can see that the sticker on the top of the card is a bit hazy. Duh. I peeled off the protective film and used some JB weld epoxy this time. I didn't drill holes in the black cover, because there is a metal heat sink directly underneath it. Success! Here it is back in the computer. You can see the case fan glommed on the side of the video card. Luckily that slot is not used, and the fan is away from the CPU side where it might have collided with the motherboard chipset cooler. The computer is up and running and seems fine under normal load. W00t! $6 case fan saves the day.